Home » Blog » New Year, New Bathroom – It’s Time to Get Green! Use refillable cleaning products You’ve probably already got a few perfectly fine spray bottles holding your current cleaning products. Instead of buying a new one each time, just buy the refills. Not only does this cut down on the amount of plastic you’re wasting, but it will probably save you a few dollars too! Clean with non-toxic products You can take your cleaning products a step further and make sure you are buying non-toxic cleaning products that are chemical-free. Good for your health, your home and the environment. Alternatively, it’s easy to use natural products you probably already have around the home like baking soda and vinegar or even lemon juice. Vinegar and water is the perfect combination for keeping those windows and mirrors sparkling. You can also spray your shower with water and a couple of drops of tea tree oil to keep mold away. Ditch the disposable cleaning wipes and paper towel If we haven’t alerted you to it by now, then here it comes: disposable products harm the environment. The build-up of plastics is taking its toll, and even recycled paper towel contributes significantly to landfill and carbon emissions. Use organic bamboo cleaning cloths or plant fiber sponge cloths that are reusable and biodegradable. Plants absorb pollutant gases like carbon dioxide and volatile organic compounds through their roots and leaves. This makes them ideal for freshening up the air in your bathroom, naturally. A pot-planted Boston Fern, spider plant or peace lily are some of the best plants to use indoors for improving air quality. If you’re short on floor or counter space (we know most bathrooms are!) try wall-mounted or hanging planters. You can create a group display for maximum effect and air quality! If you’re going to spruce up your bathroom with some practical home décor products, consider sustainable options. For example, a bamboo laundry basket is much better than a plastic one and reclaimed timber shelves are a great option if you need some additional storage. We promise they will look better too! You’d be amazed at the chemical manipulation that many textiles undergo. 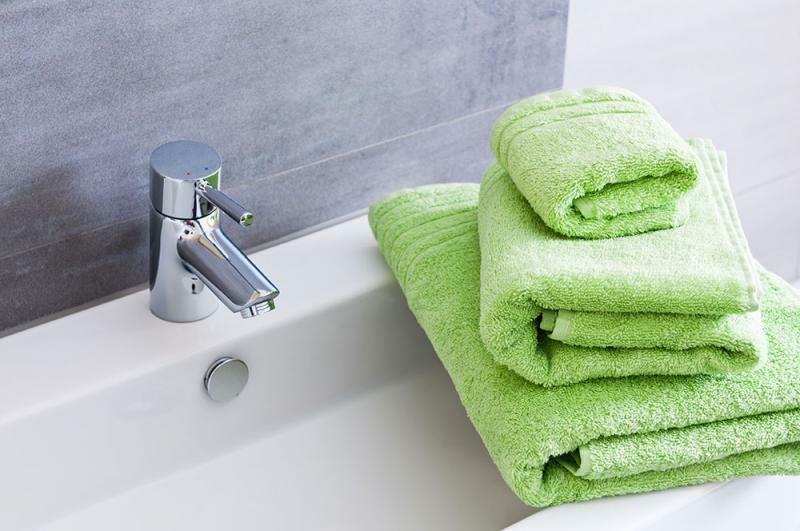 Instead, organic cotton or bamboo towels are produced to environmental standards, forgoing the use of harmful chemicals like pesticides and fertilizers. Looking for the GOTS label will let you know if you are genuinely buying towels and bath mats that meet global organic textile standards. You can also feel satisfied knowing you are supporting ethical labor standards. Personal care products like soap, shower gel and shampoo are frequently laden with preservatives like parabens and petrochemicals. These are neither environmentally-friendly nor good for your body. When you’re buying natural, organic or sustainable products, checking the labels to make sure the products are certified as such is crucial. Labelling can be quite obtuse, but you can find out more about the certification to look for here. Stop using those flushable wipes once and for all. Stay clean with Aquinelle toilet tissue mist spritzed on your toilet paper instead. You’ll have the moisture, level of cleanliness and comfort that comes with using flushable wipes, just by adding Aquinelle toilet paper spray to your ordinary, folded toilet paper. You’ll find you use less toilet paper too as Aquinelle toilet paper spray makes it’s easy to get clean! And luckily, Aquinelle toilet tissue mist is dermatologist tested, so you know those delicate areas are in good hands. Want to know more about how to use Aquinelle toilet tissue mist? Check out this post for our best tips and tricks. As we like to say, Wetter is Better!